Psoriasis is a common skin condition with the main symptom being red, scaly patches that may be sore or itchy. The patches mostly affect the knees, elbows, lower back and scalp, although skin anywhere on the body can be affected. Psoriasis can also involve the nails, and a small number of people also get pain and swelling of their joints (psoriatic arthritis). People of any age can get psoriasis, but the most common age for psoriasis to start is late teens to early adulthood. While there is no cure for psoriasis, there are treatments and self-care measures that can help control the symptoms. painful, swollen and stiff joints (in a small proportion of people) - known as psoriatic arthritis. The first symptom is often a patch or 2 of affected skin on the scalp or elbows. Over time, lesions may start to involve other areas, usually the trunk, arms and legs. Symptoms tend to come and go - there may be times when symptoms improve or disappear (this is called remission) and other times when symptoms worsen (flare up). There are several different types of psoriasis. Plaque psoriasis is the most common type. It tends to affect the knees, elbows, lower back and scalp. Lesions are raised and red with silvery-white scales. This type of psoriasis affects areas such as the armpits, groin, genital area and under the breasts. It can be associated with fungal infections. Guttate psoriasis usually affects teenagers and young adults and often develops a few weeks after an infection (often Strep throat). The trunk, arms and thighs are the usual areas affected, and the lesions tend to look like water drops. Pustular psoriasis is a rare form of psoriasis where pus-filled blisters develop on the skin. If pustular psoriasis affects a large area of skin, it can be associated with symptoms such as fever. Pustular palmoplantar psoriasis affects just the hands and feet and is a milder form of illness. This is a rare, severe form of psoriasis that involves most skin on the body. It can come on gradually in people with plaque psoriasis or develop suddenly. The skin is red with fine scales, and it is often painful or very itchy. Erythrodermic psoriasis can have serious complications and treatment can be difficult. 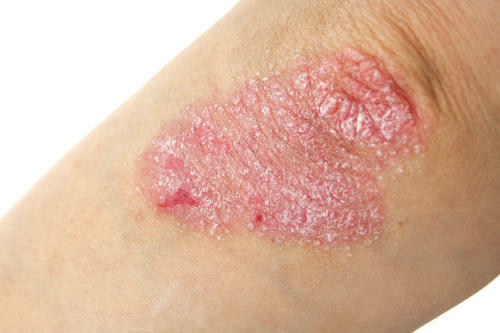 What happens to the skin in psoriasis? Our skin cells are constantly being replaced – we shed cells from the top layer of skin, and these are replaced by new cells that are formed in the base layer. In people with psoriasis, this process speeds up, so that instead of cells turning over every few weeks, it happens every few days. This means that skin cells build up on the surface of the skin, forming thickened, scaly patches. The exact cause is not known, but the immune system is known to be overactive in people with psoriasis. A type of immune cell known as a T cell attacks healthy skin, triggering the skin cells to turn over at a faster rate than normal. Psoriasis tends to run in families, so inherited factors have an important part to play. Also, certain environmental factors may trigger the development of psoriasis. You cannot catch psoriasis from another person – it’s not contagious. Some types of psoriasis are associated with generalised symptoms such as fever and complications such as infection, arthritis and even heart problems. See your doctor if you have skin changes that are new for you. If you have already been diagnosed with psoriasis, see your doctor or dermatologist if your symptoms are getting worse or are no longer being controlled with your usual treatments. Psoriasis can usually be diagnosed based on your symptoms and the appearance of the skin and nails. In some cases, a biopsy (where a small sample of affected skin is removed and examined under a microscope) may be recommended to confirm the diagnosis. This is usually only needed if psoriasis treatment is not working. Your doctor may refer you to a dermatologist (skin specialist) for biopsy or treatment. If your joints are affected, you may also need to see a rheumatologist (specialist in conditions affecting the joints). Although there is no cure for psoriasis, in most cases the disease can be well controlled. Various treatments are available - the right treatment for you will depend on the type of psoriasis you have, the areas affected and how severe it is, as well as your health in general. There is no single treatment that suits everyone. It may be necessary to try different treatments or use a combination of treatments to get the best control. People with psoriasis can help control their symptoms with some lifestyle measures. Using soap substitutes is another simple way to help skin symptoms. Gentle sun exposure can also help psoriasis, but care must be taken to avoid sun damage – see below. Special diets where certain food groups are excluded have not been shown to be beneficial for the treatment of psoriasis. People with very mild disease may find that over-the-counter topical treatments (treatments applied directly to the skin or scalp) are able to control their symptoms adequately. Topical treatments that doctors may prescribe include ointments, creams, lotions or shampoos containing the following ingredients. Corticosteroids, which reduce inflammation and skin cell production. Calcipotriol (e.g. Daivonex Cream), a vitamin D-based medicine that slows skin cell growth. Tar preparations (coal tar or ichthammol), which reduces inflammation, scaling and itching. Less commonly, dermatologists may recommend tazarotene (e.g. Zorac Cream), a vitamin A-based medicine that may ease inflammation. Some people find that they become less sensitive to treatments over time so need to rotate between different treatments. Often, a combination of treatments is recommended. Corticosteroids are usually given together with calcipotriol - there are combination preparations available. Side effects depend on the preparation used. Always check with your doctor or pharmacist about side effects. Medicines and phototherapy are usually recommended to control moderate to severe psoriasis. A combination of several therapies is often recommended. For people whose disease isn’t controlled by topical therapies alone or who have quite widespread disease, another treatment option is ultraviolet light therapy (phototherapy). Phototherapy reduces inflammation and inhibits the immune response in the skin. Artificial UV light therapy requires specialist supervision, so it is mainly available through hospitals or some dermatologists' practices. This therapy is usually given 2-3 times a week for several months. While skin redness and blisters can develop after phototherapy, there is no evidence that artificial phototherapy increases the risk of skin cancer. Regular exposure to sunlight for short periods can also help psoriasis. But it’s important to ask your doctor about the amount of sunlight that is safe, as excessive sun exposure can trigger symptoms and also cause sunburn and skin damage. ciclosporin (e.g. Neoral), which suppresses the immune system. While generally effective, these medicines can have potentially serious side effects, so close monitoring by your doctor is needed. These medicines must not be used during pregnancy. A newer medicine – apremilast (brand name Otezla) – is available on prescription and works by reducing inflammation. It can be used in people with moderate to severe plaque psoriasis. These medicines are for people with moderate to severe plaque psoriasis and those who have not responded to other treatments. Severe side effects are possible, and special monitoring may be needed for some people taking these medicines. Psoriasis and its treatment can interfere with your daily activities and lead to loss of self-esteem. If psoriasis is affecting your wellbeing, it is important to discuss this with your doctor. Many people find that joining a support group can be helpful. Support groups enable people with psoriasis to help each other by sharing advice, information and understanding on dealing with the disease. 1. Psoriasis (published Nov 2015). In: eTG complete. Melbourne: Therapeutic Guidelines Limited; 2019 Jan. http://online.tg.org.au/complete/ (accessed Mar 2019). 2. Australian Government Department of Human Services. Psoriasis - severe chronic plaque psoriasis - adult patients (1 Feb 2019). https://www.humanservices.gov.au/organisations/health-professionals/enablers/severe-chronic-plaque-psoriasis (accessed Feb 2019). 3. BMJ Best Practice. Psoriasis (updated Jan 2019). https://bestpractice.bmj.com (accessed Mar 2019). 4. Australasian College of Dermatologists. A to Z of skin: Psoriasis. https://www.dermcoll.edu.au/atoz/psoriasis/ (accessed Mar 2019).